Who wants to be in the kitchen when you could be outside enjoying the extra sunlight and spring temperatures in your neck of the woods? We’ve put together a simple one dish wonder for your family to enjoy on a weeknight or on a lazy Sunday. Since Easter is approaching, of course we had to include carrots in our recipe! Preheat oven to 350 degrees F. Grease a 13x9x2-inch baking dish or 3-quart oval casserole; set aside. Cook orzo according to package directions, adding green beans during last 5 minutes of cooking; drain. Meanwhile, cut chicken in 6 pieces; set aside. In large bowl whisk together cheese and milk until combined. Add hot orzo mixture, salt and pepper; stir until coated. Stir in carrots. Spoon into prepared baking dish. 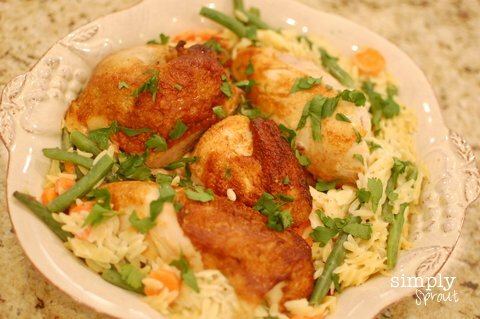 Top with chicken pieces. Bake, covered, 30 to 40 minutes or until heated through. Let stand 5 minutes. Sprinkle with parsley or Sage. Six servings. Add some chick-a-dee fun to your tabletop with this kid friendly Easter centerpiece. All that you need to complete the look is a large vase and a smaller vase to fit inside the larger one. Have your children help you count out Easter candy of your choosing (we used Peeps and Starburst jellybeans). 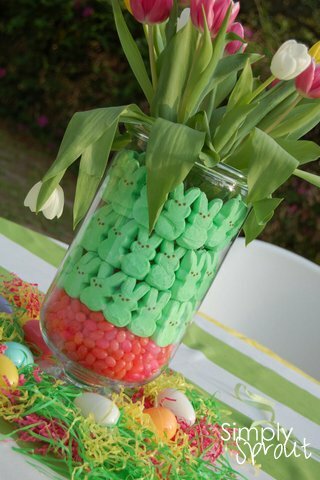 Pour the jellybeans at the base of the larger vase, layer Peeps in rows until you’ve reached the top of the larger vase. Slide your smaller vase inside, being mindful not to damage your Peeps! Fill the smaller vase with water and your favorite springtime flower. There you have it, a meal and a centerpiece that will have everyone hopping to the table! Check out some fun bunny and carrot educational activities at www.simplysprouteducate.com.